In order to bring you the best organic produce, some ingredients may differ from those depicted. Trim the root ends from the scallions; thinly slice the scallions. Strip the parsley leaves from the stems; coarsely chop the leaves. In a small bowl, stir together the scallions, parsley, lemon zest, 1 tablespoon [2 TBL] lemon juice, and 3 to 4 tablespoons oil. Season to taste with salt and pepper. Measure out 2 tablespoons [¼ cup] salsa verde for the chicken. Set aside the remaining salsa verde for the white bean salad. Pat the chicken dry with a paper towel; season generously with salt and pepper. Coat the chicken on both sides with the 2 tablespoons [¼ cup] salsa verde. In a large frying pan over medium-high heat, warm 1 to 2 tablespoons oil until hot but not smoking. Working in batches if needed, add the chicken, skin side down, and cook until the skin is well browned, 5 to 6 minutes. Turn and cook until the meat is firm and cooked through, 3 to 5 minutes. Transfer to a plate. Add more oil between batches if needed. Wipe out the pan. While the chicken cooks, start preparing the white bean salad. Shuck the corn. Lay the ear flat and cut the kernels from the cob. Strip the basil leaves from the stems; coarsely chop the leaves. In the same pan used for the chicken, warm 1 to 2 teaspoons oil over medium heat until hot but not smoking. Add the corn, season with salt and pepper, and cook, stirring occasionally, until lightly browned, 2 to 3 minutes. Stir in the white beans and cook until warmed through, 1 to 2 minutes. Remove from the heat and stir in the tomatoes, basil, and remaining salsa verde. Season to taste with salt and pepper. Transfer the chicken and white bean salad to individual plates and serve. Juice the lemon; measure the juice. Strip the parsley and basil leaves. 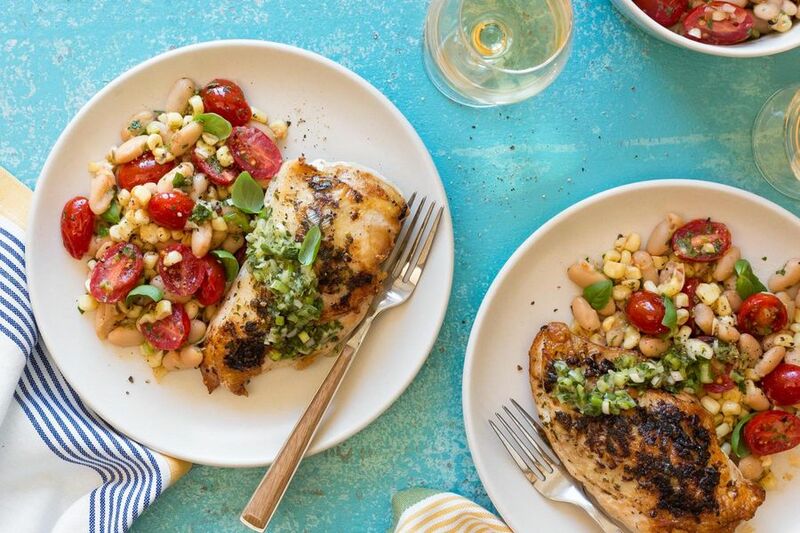 Our herby, citrusy salsa verde is super versatile, brightening both the chicken and the bean salad in this summery gluten-free supper. Sun Basket is proud to source the organic ingredients indicated below. On the rare occasion we are unable to meet our organic promise, we'll put a note in your bag. When zesting citrus, try to remove only the outermost colored portion of the rind, or zest, and as little of the white pith beneath as possible. The zest holds all the fragrant essential oils, while the pith tastes bitter. Prepare a medium-hot fire on one side of a grill. Set the chicken breasts on the grill directly over the heat and cook, turning once, until starting to brown, about 2 minutes per side. Transfer to indirect heat, skin side up, close the grill, and cook without turning until the skin is crisp and lightly charred and the meat is cooked through, about 10 minutes longer. Calories: 720, Protein: 42g (84% DV), Fiber: 9g (36% DV), Total Fat: 47g (72% DV), Monounsaturated Fat: 31g, Polyunsaturated Fat: 6g, Saturated Fat: 8g (40% DV), Cholesterol: 110mg (37% DV), Sodium: 150mg (6% DV), Carbohydrates: 29g (10% DV), Total Sugars: 5g, Added Sugars: 0g (0% DV). Sodium does not include pantry salt; for reference, &frac18; teaspoon kosher salt per serving averages 240mg (10% DV). Not a significant source of trans fat. Packed in a facility that handles all major food allergens* and gluten. *Milk, Eggs, Fish, Crustacean Shellfish, Tree Nuts, Peanuts, Wheat, Soybeans.